1. What is H1N1 or swine flu virus? H1N1 is an influenza A virus, also called as swine flu virus and it has maximum genes from the swine strain. It represents a quadruple reassortment - two swine strains, and one human as well as avian strain each. 2. How is the illness diagnosed? The illness is diagnosed after ruling out other causes when a patient presents with a fever along with a cough and sore throat. 3. Who are at maximum risk? It may affect all the age groups but, it is more common in young children and the elderly. The risk is high among those with an underlying condition such as diabetes, lung disease, liver and kidney disease or any immunocompromised state. Is there any vaccine for swine flu? How can I improve my immunity against pneumonia? Is Hepatitis B a contagious disease? 4. How is swine flu confirmed? Those patients presenting with an influenza-like illness and are positive for H1N1 either tested through RT-PCR (reverse transcription polymerase chain reaction) or viral culture, are regarded as confirmed cases. Yes, it is contagious and gets transmitted from one person to another through sneezing or coughing and spreads by large-particle droplets. It may also get transmitted through contaminated objects, close contact, and handshakes. 6. What is the period of transmission? Transmission from an infected person to a healthy person may occur from one day prior to the onset of symptoms to seven days after. 7. How to prevent its spread? As its transmission is from one person to another, prevention can be achieved by isolating those infected with H1N1, and those in close contacts, such as health care providers and attendants can wear a triple-layer mask. Those who are at a higher risk should get vaccinated. 8. Is there a vaccine for swine flu? Trivalent vaccine is approved for seasonal influenza. Vaccination should be done yearly. The efficacy of the vaccine is 70 to 80 %. Vaccines take two to three weeks to develop immunity. So, it is recommended to get vaccinated at least a month before the start of the season. 9. What are the warning signs and criteria for hospitalization? The warning signs are a high-grade fever, breathlessness, pain or pressure in the chest and abdomen, sudden dizziness, confusion and severe or persistent vomiting. If these signs are present, the patient should consult a physician for hospitalization. 10. What care should be taken during the home management of swine flu patients? Patients need to be kept in isolation for seven days. They should follow cough etiquettes, take plenty of fluids, avoid handshaking, wash their hands frequently, avoid visitors, avoid smoking, and wear a mask all the time. 11. 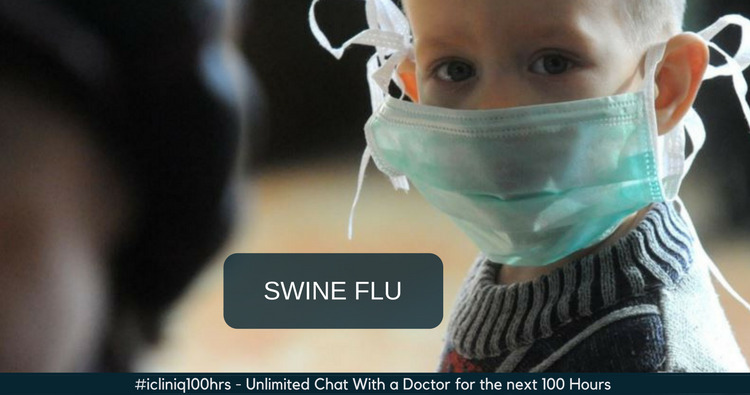 Can swine flu be treated? Tamiflu (Oseltamivir) is approved for the treatment as well as prophylaxis of swine flu. Treatment is given after evaluating and categorizing the patients based on signs, symptoms and underlying illnesses as category A, B or C. Only in category B and C, treatment with Tamiflu is required, and only in category C testing and hospitalization is required. Do you have a question on Influenza Vaccine or Contagious Disease? Kindly suggest medicine for relief from running nose, sore throat and fever.